I don’t know if you noticed lately but I have had a major sweet tooth. 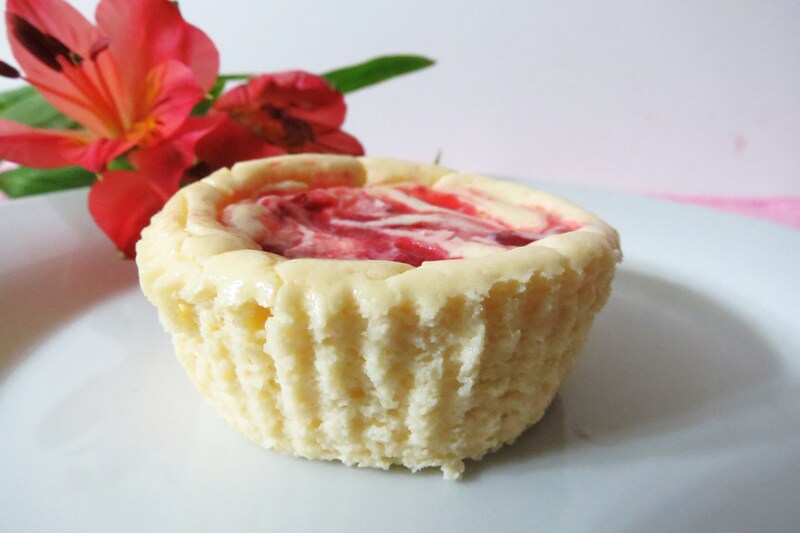 First it was Chocolate Peanut Butter Brownies, than Jelly Bean Sugar Cookies, Blueberry Lemon Bundt Cakes and now White Chocolate Raspberry Cheesecake. I must stop with all these sweets, but I can’t, there all so good. But a good thing is they are all low calorie. 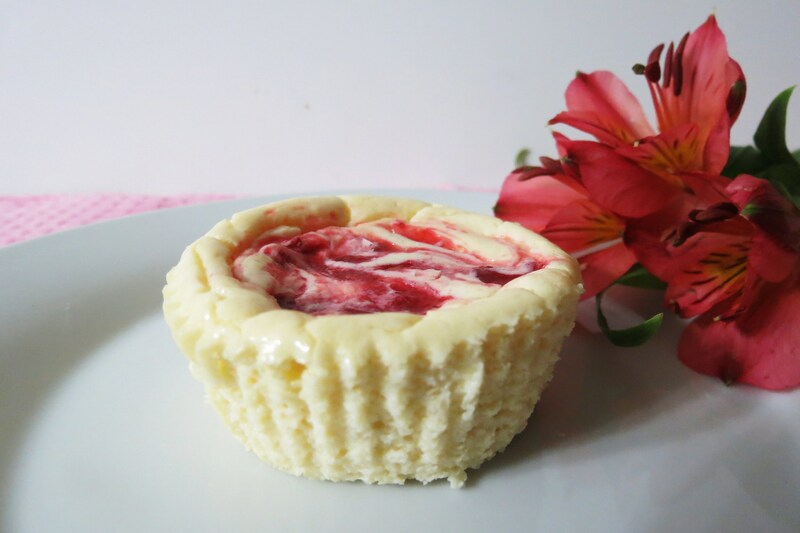 These mini cheesecakes are a spin off of my Lemon Cheesecake, but these ones are a little more decadent. 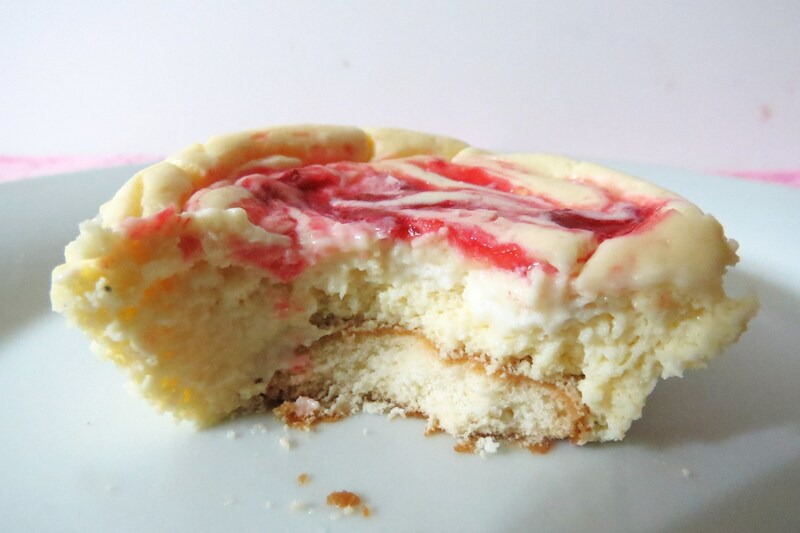 There made with Vanilla Greek Yogurt, White Chocolate and swirled with Raspberry Jam. The combination of raspberry and white chocolate is amazing together, a match made in heaven. They are absolutely delicious! There moist, rich, creamy and ultimately a guilt-free indulgent. Yes, I said guilt-free. 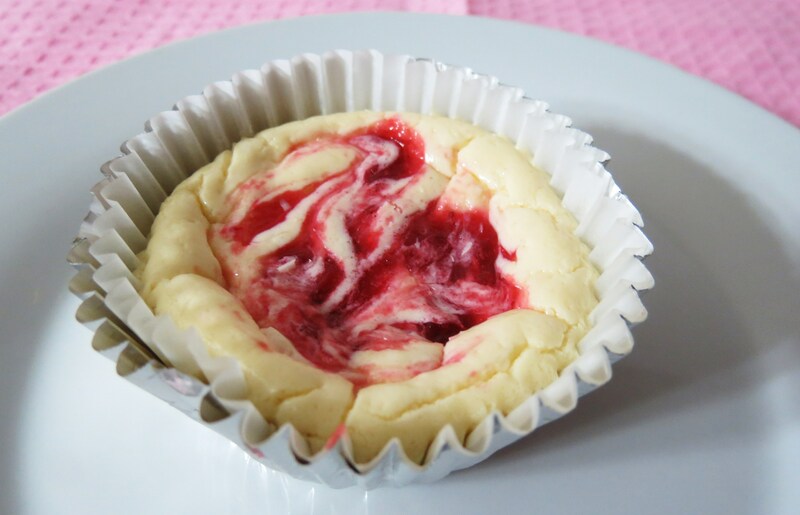 I followed your suggestions and used foil lined muffin liners and they are so much easier to remove the cheesecakes from them. Thank you for that!! These little desserts would be so perfect to serve at a brunch, Easter or any occasion, maybe just because you deserve a special treat. There also very easy to make. The whole process took about 30 minutes. You just have to wait for them to cool. Here is one all dressed up that I made for my Hubby. I think he was pleasantly pleased with his little cheesecake. I know I was! I ate two of them! I swear I feel like bingeing sometimes, because I could totally eat more of them, but I’ll settle for two, for now!! Line a standard muffin tin with 9 muffin foil liners and lightly spray with cooking spray. In a small bowl add cream cheese and sugar and beat until creamy. Add vanilla extract, egg and salt, beat until combined. Beat in vanilla yogurt and white chocolate. Place a vanilla wafer to the bottom of each muffin liner and evenly spoon the batter on top of the cookie wafer. 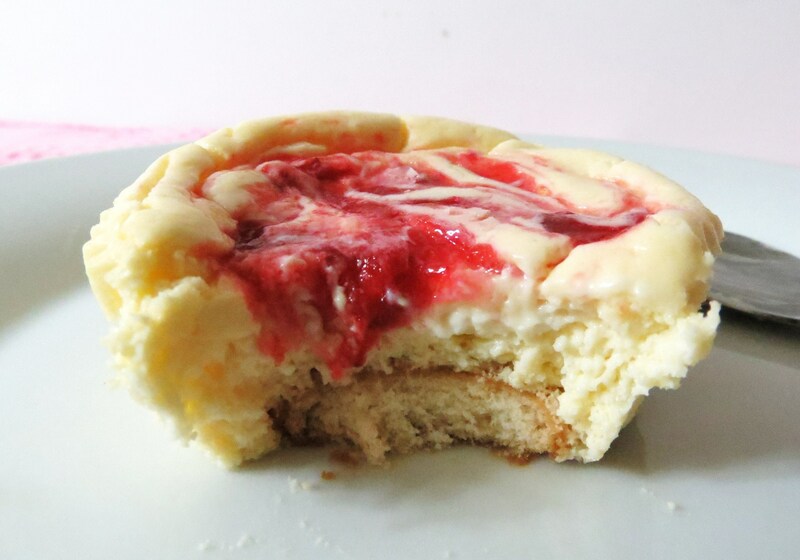 Evenly drop a small amount of raspberry jam into each of the cheesecakes and swirl with a knife. Place in oven and bake, rotating pans halfway through, until filling is set, about 22-24 minutes. Let cool on a wire rack. Chill in the refrigerator for at least 4 hours, or up to overnight, before serving. If the jam seems to thick, microwave for about 6 seconds and mix with a spoon. I tend to get on kicks with things and I can’t quite! But I am sure you have noticed that. I am on such a yogurt kick right now, thanks to Chobani yogurt. I love seeing all the different things I can make with it! Plus I love the challenge to seeing if I can make them low calorie. Can you believe I made a cheesecake with chocolate for only 76 calories? But the taste of this cheesecake is even more incredible. 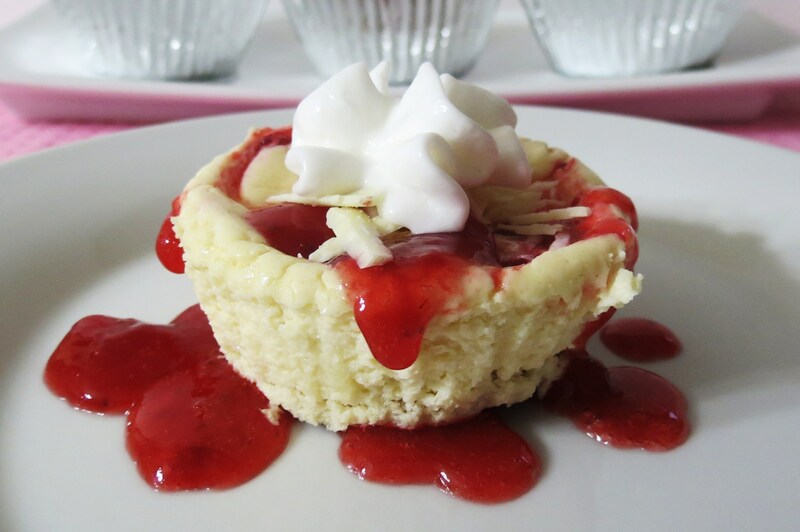 It’s so light, creamy and oh so perfect, I don’t think I could have made this cheesecake any better. Well I hoped you liked my past few days of my sweet tooth. Tomorrow I am going to try, key word here, is try to be better! I have a few blog hops coming up and I need to start creating with my special ingredients. I just love finding new creative dishes. Cooking and baking is so much fun. Thanks for telling me. I was wondering why there were two liners. lol!! Silly that I need directions on using foil liners!! Ahh, thank you!! I try to make them as healthy as I can!! I love greek yogurt! It’s my second biggest addiction next to peanut butter!! I’m glad you found me too!! 🙂 Aren’t you loving our California weather? Holy wowowowowozers! 🙂 Nom Nom 🙂 These look AMAZING! You have to have a Husband who says, eating again? Now you wonder why you complain about your weight! I really have no self control!! These look so yummy and so pretty too! 76 calories?? For cheesecake?? I am so *hooked*! You are so smart to indulge in something so delicious looking yet quite healthy, much better than trying to deny yourself and then going crazy! 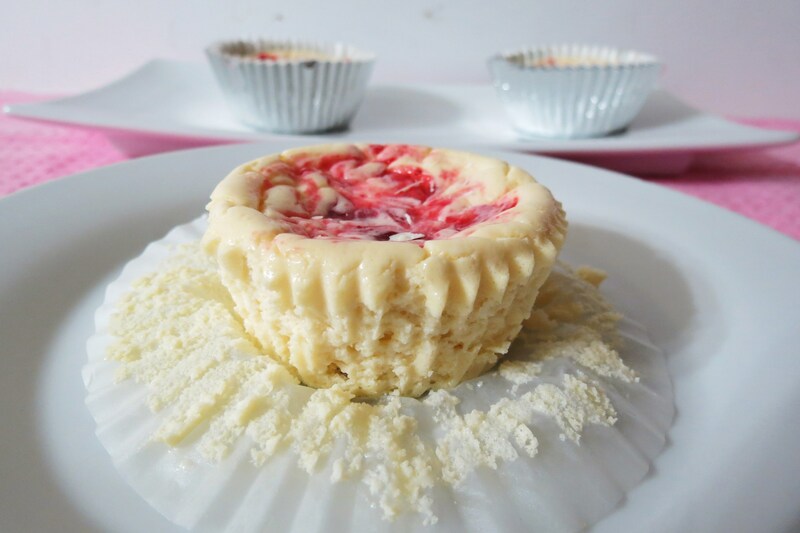 I’m a nut about raspberries and add white chocolate…….. wow! Yum! I love the white chocolate and raspberry combo. Me too! I like raspberry better with white chocolate and starwberries with dark chocolate. Ohh, I could go for either right about now! WOW! Those look SO yummy! I love individual portions! 🙂 Especially when it’s cheesecake! Thanks Winnie! White Chocolate and Raspberry make a beautiful pair! I think that this is my first visit to your blog, I welcome you to come by my blog http://jessicaslilcorner.blogspot.com and say hello and become a follower if you’d like, if you aren’t one already. I love your blog! The strawberries, yogurt with chocolate drizzle look amazing! I think I am going to make them today!! Your reasons for working out is great too! I’ve only worked out two days this week, but you inspired me. Thank you!! Oh and I signed up for your e-mails. If you try the cheesecakes, let me know what your Dad thinks! I tried these tonight for my husband’s birthday. They were AMAZING!! So delicious, he loved them. A new favorite recipe for us.